Paint protection film is a transparent polyurethane film that adheres to the painted surface of vulnerable areas on your vehicle. It can be removed without any damage to your paint and does not effect appearance and aerodynamics. It is not visible from just a few feet away and with minimal maintenance the film will last many years keeping your paint protected while looking great. Why choose your kits over the competition? See our comparison page by clicking here. This is a MUST READ. Note: Scotchgard Pro is clear coated. Suntek & Ventureshield are top coated. Be wary of inexpensive kits from our competitors offering clear "glossy" film (but non clear/top coated) as this won't have the shine you desire and can start to look bad in just a few short months. BE WARY of the cheap 4mil film that is being sold as paint protection film! Are your paint protection kits difficult to install? We went through extra efforts to find the perfect product/film that would allow a first timer to have great success in installing our product. The patterns were designed with the do-it-yourselfer in mind without sacrificing coverage. We supply the tools needed, instructions, customer support and a great product so you can succeed with a perfect installation. The majority of our customers install the kits without any prior experience and are very satisfied with the outcome. In fact, a lot of our business is repeat business. Please note, we have no way of knowing any persons skill level or if they will have a successful outcome in installing our kits. It is up to the individual to decide to take the kit to a professional installer or install the film themselves. The kits are all tested to fit correctly and unless you take the kit to a certified installer we can't guarantee the fit or outcome of your installation. You offer 3 films. Why? Which do I choose? Help! 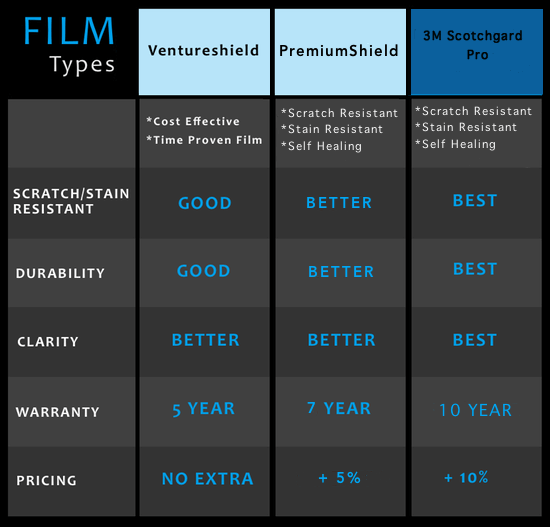 We offer 2 different 3M films (Ventureshield and Scotchgard Pro) and we also offer Suntek film. Ventureshield is our standard film, great quality and made by 3M. Scotchgard PRO (10 year warranty) is one of our premium 3M films which is easier to install than Ventureshield, it's self healing and stain resistant. They are all 8mils thick and very high grade films. If you are undecided and want more information please click here. NOTE: THERE ARE NO LOGOS ON THE PRO FILM & SUNTEK FILM. IT COMES WITH A PLAIN BACKING PAPER. Do you cut out for parking sensors and headlight washers? It depends. We may have the design for your bumper kit but don't have the design for these areas already precut. If you don't see the diagram showing the cutouts and want to be 100% sure please contact us and we can give you this information. On our website we do ask the question on the bumper kits "Does your bumper have headlight washers or parking sensors" but this does not mean we have a pattern available. We simply ask it to get as much information as we can about your car. Usually we do have every option available. Does the mirror kit cover the entire painted area of the mirror? This is a common question we get once someone receives the product. Mirrors are usually very curved and if the design covered the entire painted surface of the mirror it would be very tough or impossible to install. A lot of our kits are designed to cover the most vulnerable area of the mirror. It is very unlikely the mirror will get chipped on the top since most debris is coming from the front so often the top is not 100% covered. If you want to be sure you can email us and we can give you a measurement of our kit. In some cases, if the mirror backing is pretty flat, the film will cover the entire surface. How does your film compare to the spray on product? Paint protection film is meant to be semi-permanent. It can be safely removed but can last 5 years or longer. We consider the spray on protection as more of a temporary product which should be removed in about a year or less. In the long run it is actually cheaper to purchase paint protection film since it only needs to be applied once. Are there any special tools needed to install the product? Yes, but we supply them for free on precut film orders over $75.00. We include 2 quality 32 oz. sprayers, rubber squeegee, razor type knife, mirco-fiber towel and DVD or online video installation instructions. This kit eliminates difficulties due to not using the proper tools. (note: the installation kit is supplied on precut paint protection film orders only. We don't supply this kit for free on bulk film orders sold by the foot) We supply one free installation kit if multiple orders are made by one customer for the same car. The installation kit can be used on dozens of installs without the need for anything new. For additional tools you may want to add to your order click here. What if I buy a complete kit but need to reorder an individual piece from that kit? I can't locate my car or model in your catalogs? Odds are we have a kit for your car but it just takes us time to update the website since new models are always coming out. Odds are we have a pattern for your car so just email our customer service rep julie@invisiblemask.com and she will be happy to help you out. How are your paint protection kits any different from your competitors? Using the proper film is just half the battle. In our years of experience as a certified installer we feel that we offer the 3 best films on the market. But aside from using a great film you must have a proper fitting pattern. Don't be fooled by companies marketing name brand film and very poor fitting patterns. In the end you will just be frustrated because it just won't fit correctly. As the saying goes "You get what you pay for!". I saw a cheaper price for the same clear bra kits you offer. Will you match it? We will not only match it but in most cases we try to beat it. But keep in mind when shopping around, a cheaper clear bra kit may be smaller and provide less coverage or use cheaper film than we offer. We need to verify it is a comparable product before we can match it and this usually means us taking a look at where you saw this cheaper price. But don't worry! We have a Price Match link next to the Add to Cart button where you can enter in a few things and purchase the product on the spot! Keep in mind, we do check these price match orders for accuracy so be nice to us. Is Headlamp film different than paint protection film? What area of my car will be covered? Every year make and model are different. Generally the hood, fenders, side mirrors, bumpers are included, and other kits have the option to include headlights, rocker panels, door handles, door edge guards. Patterns are professionally designed based on each year, make and model. You get to pick which pieces you want. We don't require purchasing a complete kit like some of our competitors. You offer different hood sizes, why and what does it mean? The most popular hood coverage is cut on a 24" sheet of film which usually means 20-23" of hood coverage. Some of our customers don't want this much coverage or they are looking to save some money on the kit so we usually offer 2 smaller sizes. We basically take that bigger kit and cut it down in our software to the next size film (18inch) and the smallest size is cut on a 12" sheet. You can select which size you want in our catalog online if the option is available. For newer vehicles we do offer 30" and full hood coverage kits. Note: The 12" size may not include fender pieces because this kit is so small that the fender pieces can't line up to the hood piece. How do I install this kit myself? On precut film orders over $75.00 we include our instructional video along with the proper tools needed (not just a squeegee like our competitors). We honestly feel this is a do it yourself product because our films and patterns are easy to work with. The videos & online written instructions will guide you through every aspect of the installation and if you still feel you can't do it then contact us and we will provide you with local installer information. Is there a Certified Installer in my area? Most likely! There are certified installers all over the U.S. and we can provide our customers with full information upon ordering any of our products if you wish to have an installer apply the kit. After your purchase, email us at sales@invisiblemask.com with your order # or full name for installer details. Do I need to do anything to maintain my vehicle once applied? Wash and wax as you normally would, with mild soap and water as early as 24 hours after the film installation. Use waxes that do no contain dyes, abrasive polishes and/or rubbing compounds. 3M recommends 3M Performance Finish when waxing your car. Another wax we recommend is Meguires NXT. After waxing your car, you can remove any wax build-up along the film edges with a lint-free cloth. Can I reuse this material once I apply it? No, Paint Protection film must be applied immediately upon being removed from its backing. The film can not be removed and reused once applied. Please click this link. Scroll to the bottom of the new page. Will this product damage my paint? This product is designed to help protect your OEM factory paint, not damage it. Note: We do not guarantee the film, installation results or provide any type of warranty if applied to unpainted surfaces or non OEM factory paint. Please note: Before applying any film or product to your car please make sure the paint surface is free of dust or dirt. The slightest bit of dust may cause scratches if using a dry cloth, setting the film on the hood and sliding the film around or even leaning against the car. If laying the film on the car to judge fitment it's best to thoroughly clean surface and then wet the surface with soap/water, wet film backing and then lay it down. Make sure film backing is clean. Since we offer 3 films and 3 different prices they offer different warranties. Ventureshield is 5 years, Suntek is 7 years and Scotchgard Pro is 10 years. You can select which film you prefer when adding the part to your shopping cart and there is a small price difference for Scotchgard Pro and Suntek. The warranty covers cracking, peeling, discoloration and any type of film defect. It does not cover damage from normal use, road debris, vandalism and that sort of thing. You must use a certified/trained installer to be eligible for the full warranty. InvisibleMask will stand behind the product and if we see there is an issue with the film/product we will do our best to take care of it for our customers. Yes. It can be removed easily and will not damage the paint. To remove the film, you must heat the surface to approximately 120°F while working a corner of the film with your fingernail. Once you have enough of the material free from the surface to hold on to, slowly pull the film from the paint. A "safe for paint" adhesive remover can easily remove any residue if this occurs. How hard is it to see on the car after it is applied? The material is over 95% clear. On any color darker than stark white, you can't see the film from a few feet away. On a stark white car, you can see that ~5% of color, but it still is "invisible" at a short distance. See our gallery for some examples. Will my kit fit perfectly, edge to edge? You will need to talk to your body shop and see what they recommend. The time will vary depending on the type of paint the body shop used, and whether or not the paint was baked. In any case, the time that they say you should wait to wax the paint, is the same time you will need to wait to install our product. Generally this is 30 days. All orders exceeding $75 in total are shipped via USPS Priority mail at no charge to customers in the U.S. Orders under $75 are charged a $6.00 shipping fee within the U.S.. Express mail upgrades are available for a $35 fee. Canadian customers are charged a $25.00 shipping fee for USPS priority mail. Priority Mail orders are usually shipped within 48 hours and please allow up to 5 days in transit. This means it could take 7-10 days to actually receive your package although it is usually in under 5 days. Express Mail orders usually ship within 24 hours. Please understand that choosing (express) overnight does not necessarily mean your order will be in your hands tomorrow. We do not ship orders Sundays. IMPORTANT NOTE: All of our kits are custom made. We don't pull them off a shelf so it can take us a day or two before it gets shipped and with express mail we try to get it out right away but there is a possibility you may not receive the package until day 3 or 4 after ordering (if in the U.S.). Do you sell bulk film? Yes. Please visit this page to order bulk film. How can I become a dealer of your paint protection kits? Please click here to learn more about our dealer program. I want to talk to a human before I order. How can I? We do our best to answer all calls and emails in a timely fashion. Our hours are 9am to 5pm PST Monday-Friday and our toll free number is 1-866-927-5678. You will also see our live operator chat button throughout the website if you have a question.